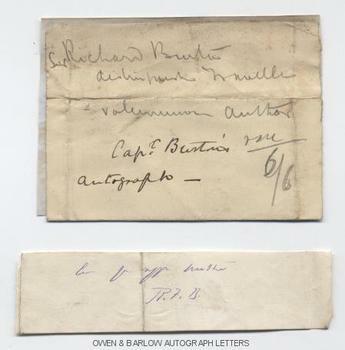 SIR RICHARD FRANCIS BURTON autograph Signature. British explorer, scholar, orientalist and soldier. Paper piece from foot of an ALS with two lines in his hand, signed with autograph initials. The line of text on the verso reading "I found Isabel and her [nice?] brother". "Isabel" is identified in pencil in another hand as being Lady Burton. Contained within the original 19th century collector's folding paper docket. The paper piece measures approx. 1 x 4 inches. Slight age marking but in very good condition. Sir Richard Francis Burton was one of the most colourful characters of the 19th century. With JOHN HANNING SPEKE he made explorations in Africa of the Great Lakes and in search of the source of the Nile. He is also noted for his pilgrimages to Mecca and Medina and for his translation of the Arabian Nights. Burton had become secretly engaged to Isabel Arundell before setting out for his exploration of the Great Lakes of Africa in 1856. Her family, who were devout Catholics. had forbidden her to marry him, not least because of his well-known atheist leanings.